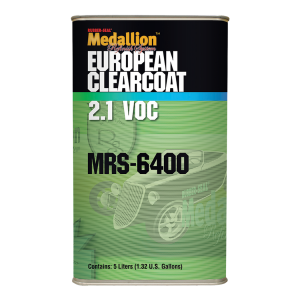 MRS-6400 European Clearcoat is a high solid clearcoat formulated with premium European resins to provide exceptional gloss and a long-lasting finish. This 50 state compliant clearcoat is easy to spray and has excellent leveling properties. MRS-6400 is ideal for use on overall refinishing projects. It mixes 2:1 with MRS-6360 Fast, MRS-6375 Medium or MRS-6390 Slow Activator. It can be applied in air dry or bake environments. Available in 5 liter cans and in quarts.